The little warm breakfast sandwiches we get from Ronda, our chef, when you are a part of the team that departs early in the morning for a day of filming. The smell coming from the forward bilge from the rotting vegetables. The missing bag of cabbage has now been found. Day 9 proves an exciting day for both land and sea teams. On Tern Island, a Hawaiian monk seal that had gone missing from Trig Island the previous day is found and relocated to its mother. 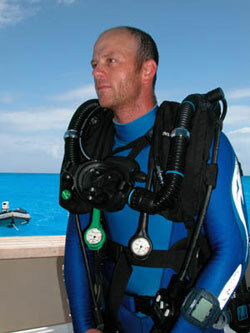 Out at Rapture Reef, the sea team tests the closed-circuit rebreather system for the first time. Testing the equipment is a time-consuming process, but important for safety, and the team is rewarded straight away on their next dive, as the bubble-free divers are fantastic for filming, both because the bubbles don't get in the way of the camera and because they don't spook the fish. Yves is able to film a masked angelfish at quite close range. Incredibly rare and valued at $7,000 in aquarium trade, this kind of fish has no close relatives and is thought to have been in the Hawaiian Islands for a very long time. With all the technology and knowledge we have, we are still in awe after each and every dive. Sitting mid-water while tending cable and watching the divers' bubbles go all the way to the surface in crystal clear visibility. This is some of the clearest water I have ever dived, and I am overwhelmed by the amazing visibility. Transferring gear between the zodiacs and the Manacat or the Searcher. The cuts and bruises all over my legs are testament to a hard day's work in the field. A typical day for the team is an early start with many things that have to be prepared for different teams heading out for the day. The zodiacs have to be checked for fuel and the pontoons topped off with air. The batteries have to be charged for both the cameras and the underwater lights. Tanks have to be filled and analyzed to confirm the mixture of Nitrox. It is amazing to me how much time we have to spend troubleshooting and fixing problems that continuously come up, and our evenings are devoted just to that. There are many rewards associated with this type of work, and one of my favorites comes from the moments when we get to see the fruit of our labor by watching the tapes of our day's work. NONE. The only time I have had a chance to relax so far was one enjoyable evening on Tern Island where we met the island staff, made new friends, and shared great stories of expedition life and fieldwork. Is it possible??? YES ... really everything we are doing is fun ... we are all working hard and very long days, but it is the whole experience, from the months of preparation back at the office, to the realities of being able to see the birds soar over our boat out in the middle of nowhere. Every day I'm finding every new experience fun. I started researching for this expedition over 13 months ago for our producers, and it is fun to finally be here, in the waters of the NWHI. I have been dreaming of this moment for all these months. The pictures that I have had in my mind are now replaced by vivid images that are better than I had ever imagined.